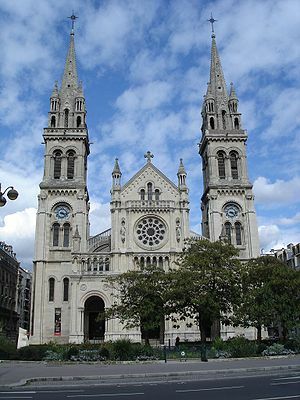 The Church of St Ambroise, located and named after the "quartier" in which it stands, was built during the reign of Napoleon III. A second Empire church, constructed in the Neo-Romanesque and Monumental Style, it was built between 1863 to 1869. The Church was designed by architect Theodore Ballu, who also constructed the Church of the Trinity and the Church of Saint Joseph. He was also responsible for the restoration of the Tower of Saint Jacques on the rue de Rivoli. The Church of Saint Ambroise has two beautiful towers 68 meters high. These impressive towers dominate the skyline of the neighborhood. There is a very nice garden square in the front of the church and it sits in a lively neighborhood on the rue St. Ambroise. The exterior of the Church of St. Ambroise is very impressive and ornate, typical of 2nd Empire churches. Carvings in stone decorate the facade and the towers. The interior of the church is vast and very inviting. There are four paintings by Jules Eugene Lenepveu, late 19th century French Painter whose paintings of Joan of Arc can be seen in the Pantheon. There are also mural paintings by Alphonse Jacquier and Francois Perradin and a fine sculpture of the Virgin and Child by Eugene-Andre Oudine. Many fine stained glass windows grace the arches of the walls and imbue the interior with soft and attractive colors. Truly a gem of a structure in the 11th arrondissement.